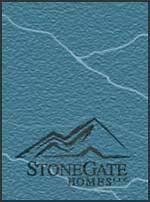 For more than 30 years, StoneGate Homes has been designing and building distinctive and innovative homes for Colorado families. We make sure integrity, craftsmanship and hands-on commitment are a part of your home from the day of groundbreaking to the day you move in. Your satisfaction in the homebuilding process is as important to us as how you feel about your finished home - and that one belief is what makes all the difference. to ensure you end up with exactly the home you want. And we take personal responsibility to exceed your expectations. We're family-owned, family-operated and not afraid of hard work. Old-fashioned? Maybe. But to us, it's a philosophy that will never go out of style. Whether you're looking to modify and build an existing floor plan at one of our available sites, or you want custom builder service for a home designed and created specifically for you on your own lot . . . you've found us, and we look forward to meeting you.